It’s getting hotter. You know what that means, summer is here! And it’s time to celebrate these sunkissed days. Summer, as we know is all about sunglasses, chilled beer, cocktails, coolers, flip-flops, laughter, memories, shopping and a lot of happiness. 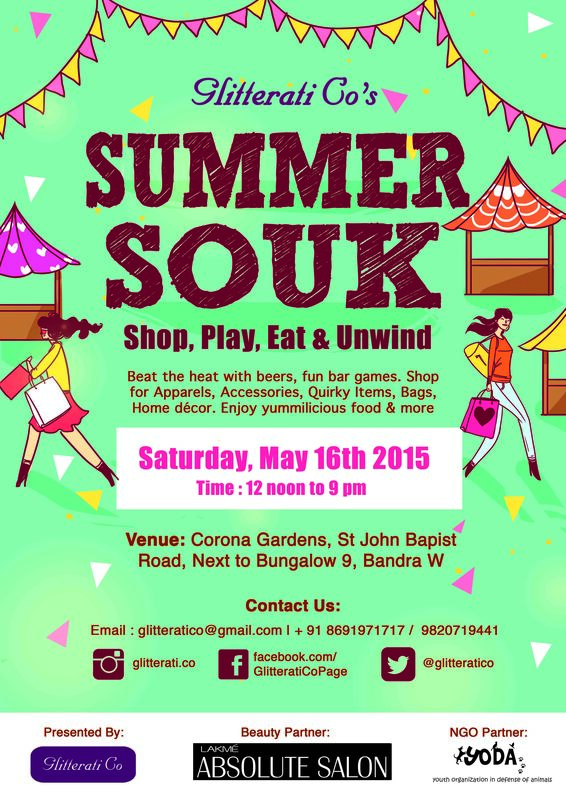 On Saturday 16th of May, Summer Souk is celebrating the sunny days at the Corona Gardens, Bandra (west) through a pop-up gala for the city which could be one’s getaway for the weekend. Around the hustle and bustle of the city, this old bungalow with a serene garden porch surrounded with trees has a treasure box filled with edgy & colorful fashion clothing, accessories, bath & body treats, bags and clutches, artwork, healthy juices, tasty treats and a lot more - at one destination. The grand summer festival has been designed to create an upmarket shopping experience filled with fun, quirk and style. It is a venue adorned with colorful décor, draped with hangings to compliment the season of summer and perfectly lit up for evening selfie-sessions. The festival features more than 40 unique shopping brands like Chucklez by Ishita, Gia Bath and Body works, Rimayu Accessories, Glass Garage, Raw PRessery, Maati, Runway Rebel, Georgian Deli and a lot more. With partners like Lakme, White Owl and Yoda on board, the pop becomes more exciting. Having Lakme on board, we have numerous offers like express make up on the Lakme booth, discount vouchers and offers to walk-ins, Lucky draw on purchase of Rs. 5000/- and more where in the winners will get a free haircut or express manicure/pedicure. With White Owl, artisanal chilled beer will be sold and also an amazing Beer Pong session will be conducted. Yoda is coming on board with its exclusive merchandise, where all the money will be used for the welfare purposes. While women are busy calming their nerves at this shopping paradise, the men can beat the heat with some chilled beer and interactive bar games. The DJ will be at your service right from noon till late evening. With some live music, a pottery zone and the presence of out of the box artwork, Summer Souk will be the perfect place to enjoy a warm afternoon and give oneself a dose of pop up life-style and food all together at one place. Also, Tarot Reading sessions will be conducted by celebrity Tarot Reader Monica Singh Dudaney to keep the dramatic vibe of the event alive. Entry charges might blow one’s mind because it is free. Summer Souk is a shopping paradise, fun-time and life-style destination which is a must experience. With very unique yet subtle shopping options and more fun activities to rejoice and enjoy the originality, creativity and innovative ideas – summer souk ought to be on one’s bucket list. So let your hair down and enjoy this cool summer weekend with shopping, food, fun and unwind.